Lasik surgery hospital in India: Doctor, Treatment and Cost. LASIK is a surgical procedure intended to reduce a person's dependency on glasses or contact lenses LASIK stands for Laser-Assisted In Situ Keratomileusis and is a procedure that permanently changes the shape of the cornea, the clear covering of the front of the eye, using an excimer laser. 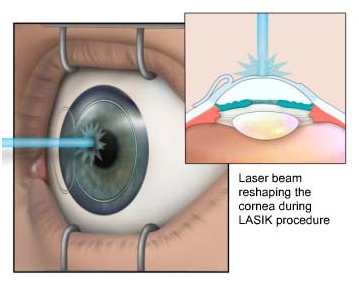 A mechanical microkeratome (a blade device) or a laser keratome (a laser device) is used to cut a flap in the cornea. A hinge is left at one end of this flap. The flap is folded back revealing the stroma, the middlesection of the cornea. Pulses from a computer-controlled laser vaporize a portion of the stroma and the flap is replaced. Q. How does LASIK work ? Q. Types of LASIK ? There are a variety of different types of lasers used in ophthalmology. All LASIK procedures are performed with a specific type of laser (excimer laser), so in one sense, all LASIK procedures are similar. Further, there are different types of laser ablations that can be performed ,including conventional laser treatments, wavefront-optimized treatments, and wavefront-guided treatments. Finally, a completely different type of laser (femtosecond laser) can be used instead of a mechanical microkeratome to create the LASIK (corneal) flap. Q. Am I a good candidate for LASIK ? 1. Am I willing to accept a low but real risk of surgical complications? 2. Does my career allow me to have LASIK ? 3. Has my vision been stable long enough to have LASIK? 4. Do I have any health conditions that make me a poor surgical candidate ? 5. Do my recreational activities make me a bad surgical candidate ? 6. Am I too young or too old to have LASIK ? 7. Do I have keratoconus ? The safety and effectiveness of refractive procedures has not been determined in patients with some diseases. Q. What should I expect before, during and after surgery ? Prior to any procedure, you will need a full eye examination by your eye doctor. This process will help determine if you are a good candidate for surgery and whether you have certain risk factors listed above. If you wear contact lenses, you should take them out for many days before your initial examination and use your glasses full-time. This is important because contact lenses will change the shape of your cornea, and if your cornea has not had enough time without the contact lenses, then the measurements taken before surgery may be inaccurate. You should discuss the amount of time you are required to be out of your contact lenses with the surgical center performing your evaluation. After you are lying down and have been positioned underneath the laser, numbing eye drops will be placed in your eyes, and the area around your eyes will be cleaned thoroughly. After your surgical team, including your surgeons and assistants, have reviewed and confirmed all of your treatment information, a lid speculum will be placed to keep your eyelids open during the surgery. When it is time to create the LASIK flap, a suction device will be placed on your eye that will fixate it. During this period, you may feel pressure that may be somewhat uncomfortable, and your vision will go dark for a brief period of time. Your doctor will then use the microkeratome to create the corneal flap. After the flap has been created, the microkeratome will be removed, the suction will be off, and your vision will return, although it will likely remain blurry for the remainder of the procedure. As soon as the procedure is finished, you may notice that your eyes feel irritated, burn, itch, or feel like there is something in them. Your eyes will frequently water or tear excessively, and your vision will be somewhat blurry. The most important thing to avoid during this time is rubbing your eyes. Do not rub your eyes under any circumstances, as rubbing can dislocate or shift the corneal flap, which could require you to have an additional procedure to reposition it. Using copious artificial tears and resting with your eyes closed will most effectively ease these sensations. In some instances, there may be increased discomfort or even a mild degree of pain, for which your doctor may advise you to take a pain reliever. In most cases, nonsteroidal anti-inflammatory drugs, such as ibuprofen, are enough to relieve the pain. In addition to artificial tears, you will have antibiotic drops and anti-inflammatory drops (steroids) to use beginning on the day of surgery that you will continue to use for days to weeks after surgery. Q. What are the advantages of LASIK surgery ? Q. What are the disadvantages of LASIK surgery ? Because each patient will heal slightly differently, results may vary from patient to patient. LASIK could make some aspects of your vision worse, including night vision with glare and halos. LASIK may make dry-eye symptoms worse in certain individuals. In rare circumstances, LASIK can make your vision worse and not correctable with regular glasses or contact lenses.